When people die their children usually go through the deceased possessions and divvy up the family mementos which usually include photographs the dying person has collected in their lifetime. My wife and I have the photographs from her family and my family. And when people in your family know you have the family photos they tend to send you the odd photo in their collection that would mean something to you from their family. Awhile back my cousin Alana sent me some pictures she had inherited from my grandmother when she died. I had not heard from my father’s side of the family in decades, so we had a lot of catching up to do. One of the photographs is four grown sons and their father and mother. One of the sons is my father’s father, or my paternal grandfather that I never knew. I never knew my maternal grandfather either. All I ever knew about family history was was from my two grandmothers. 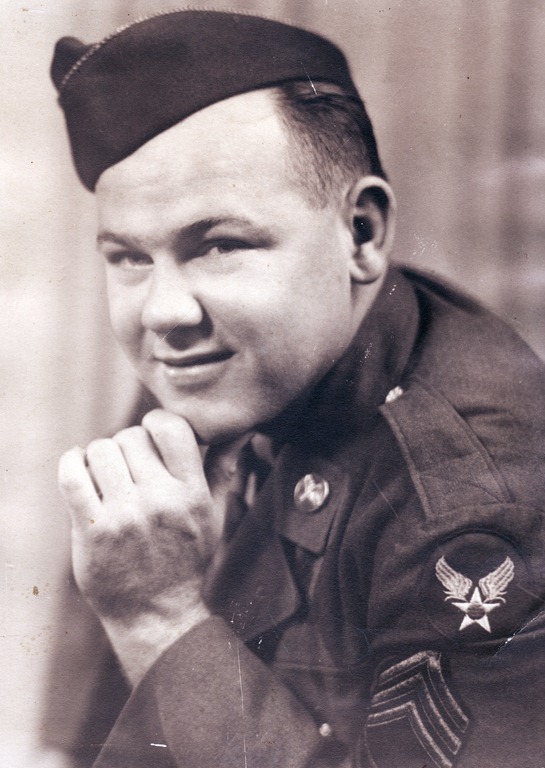 So this photograph introduced me to my grandfather, and great grandfather and grandmother, as well as three great uncles I never remembered even mentioned by anyone. I wonder about their families. Is there anyone like me with a copy of this photo wondering about the other three brothers? My grandfather was named George Wallis Harris. I’m James Wallace Harris, so somehow the spelling got changed, or the spelling from the genealogy was wrong about my grandfather. He married Helen Imogene Delaney, and my dad was called George Delaney Harris. I almost was James Delaney Harris. My father’s father was the man on the right. His brothers were from the left, Jan, Charlie and Carl. My grandfather was born in 1897 and my grandmother in 1898. 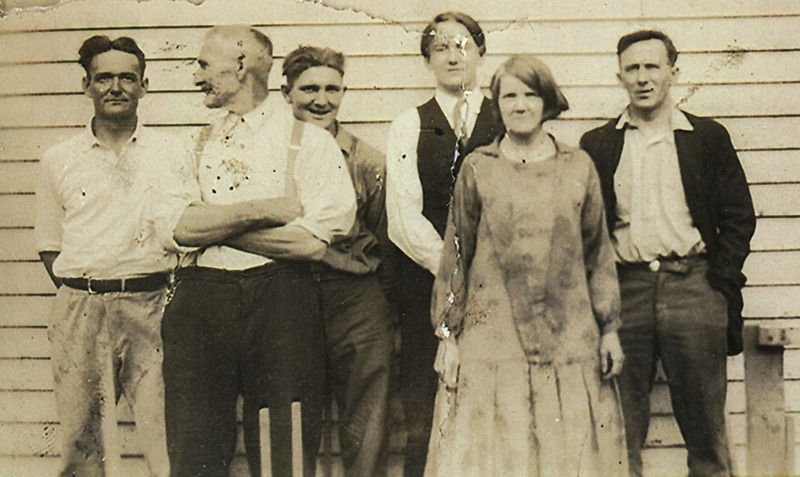 The older couple in front of the sons are my great grandparents George General Harris, born 1872, and Minnie Maude Maynard, born 1871. All I know about these people is they lived in Nebraska. 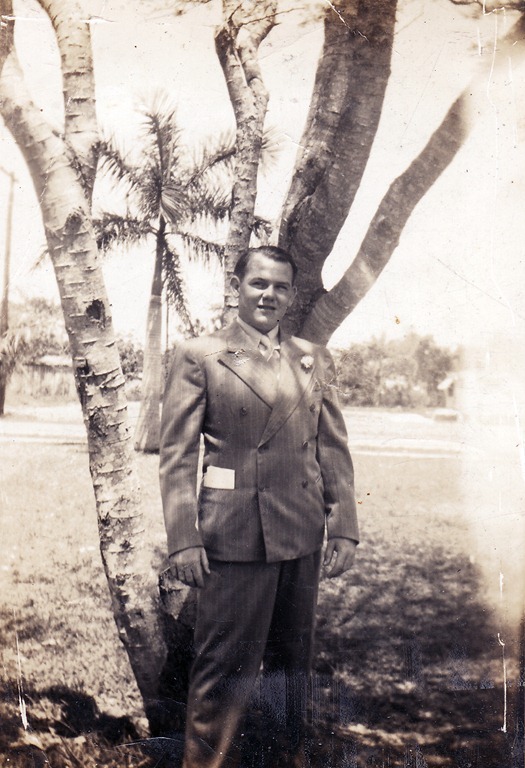 My father was born in Nebraska in 1920, but moved to Miami as a small child. I can remember him telling me stories about visiting Nebraska, and how the farmers would get together to kill jack rabbits by walking side by side down the fields to flush them out. I think my great grandparents worked a farm, but I don’t know. Only two of them bothered to dress up for the photo. I can’t tell if my great grandmother’s dress was dirty or is the smudges part of the photo or the copy of the photo. 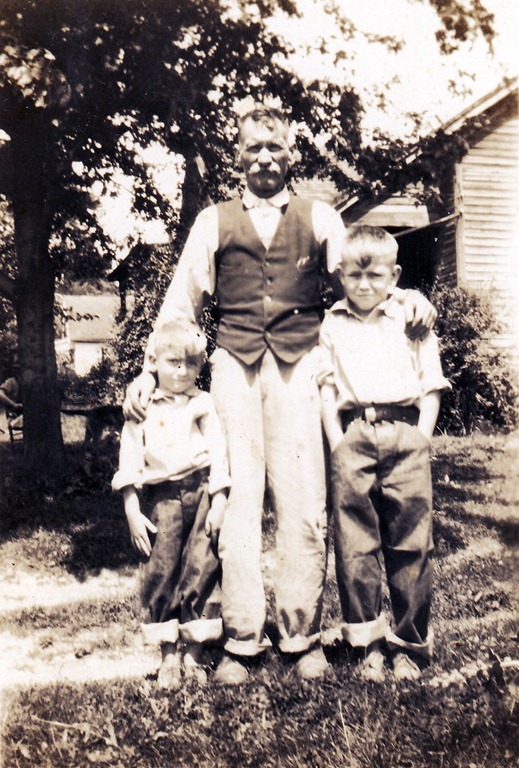 I found one other photo among my mother’s photos that I think is of my great grandfather and my father and his younger brother Jack. I don’t have any photos of their younger brother Bob at all. When I say owning the families photos are a burden or responsibility it’s because I have pieces of history, and maybe the only known copies that are evidence to people’s lives in the past. I uploaded this photo to the web so my cousins could have it, and maybe convince my nephews to take interest. Since Susan and I have no children I’m not sure where our photo collection will go when we die. I assume we’ll give everything to our nephews and nieces. We should give them copies now before something happens. If our photos were to be burned up in a fire or destroyed in a flood, all these unique views of the past would be gone. So I’m thinking I should put in the extra effort to preserve them. It’s a shame there isn’t some kind of national historical photo registry. There might be people alive today that could tell me more stories about these people. All I know is my grandfather and grandmother, who is from Indiana, moved from Nebraska to Miami in the 1920s, but I don’t know how early. 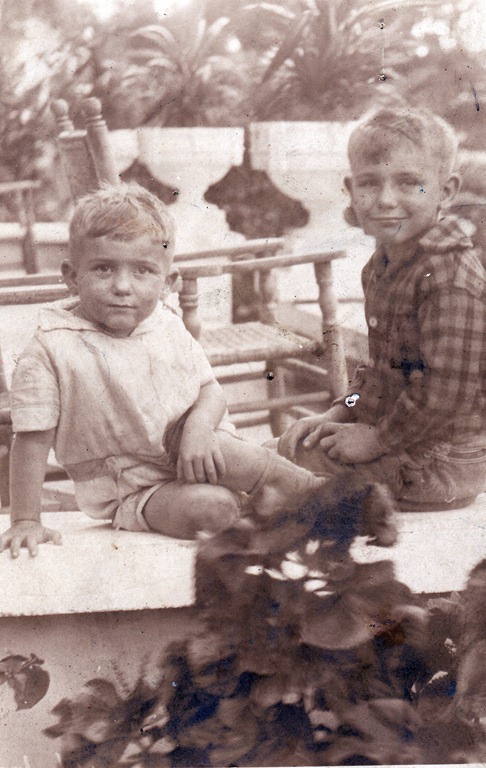 I do know they were there by 1928 because I have this photo labeled “George Jr. and Jack Harris 1928, Coronado Apts. N.E. 17th Terrace.” I had heard stories of them talking about the great Miami hurricane of 1926, but I don’t know if they there then or not. My sister says my grandfather was referred to as a barefoot mailman, but that was something that started in the 1890s and I don’t think they were there that early. Uncle Jack was born in Nebraska in 1924, so I assume they came to Miami between 1924 and 1928. My father died when I was 19. He always worked two and three jobs and was never home except to sleep, so I don’t remember talking to him much. He was in the Air Force and we moved around a lot. But we mostly lived around Miami, and when we were there I’d see my grandmother Helen Delaney Harris, whom I called Ma. She mostly talked about growing up in Indiana. 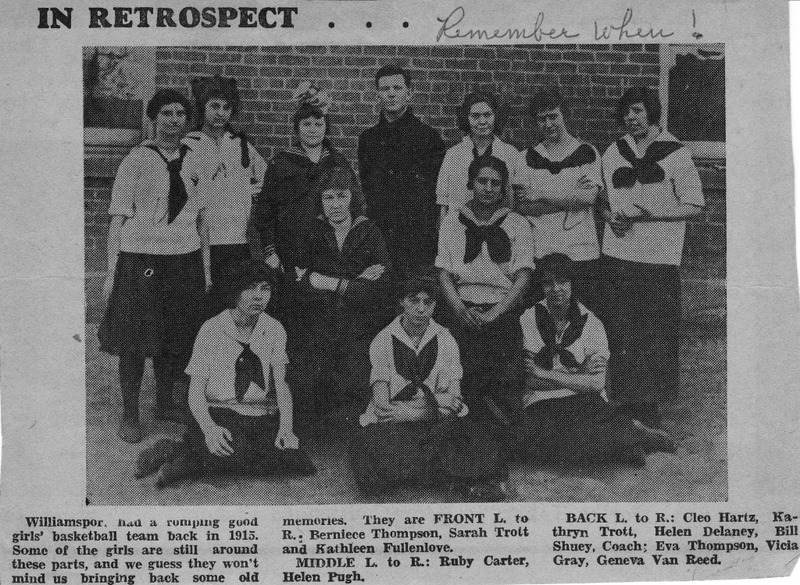 I only have a few photos of her, the earliest of which is a newspaper clipping. She’s third from the left on the top row wearing some god awful bow or flower on her head. I only remember a few stories about Ma even though I used to stay with her. She managed apartments when I was growing up and sometimes my parents would leave me with her. The apartments were always ones where old people lived and I’d hear a lot of stories about the old days, including meeting an old lady who had been on the Titanic. I wished cheap video cameras had existed back in the 1950s and 1960s so I could have recorded these memories. That’s the thing, all we have now are the photographs. The stories pretty much went in one ear and out the other. I wished I could have saved them. Here’s the best photo I have of Ma. 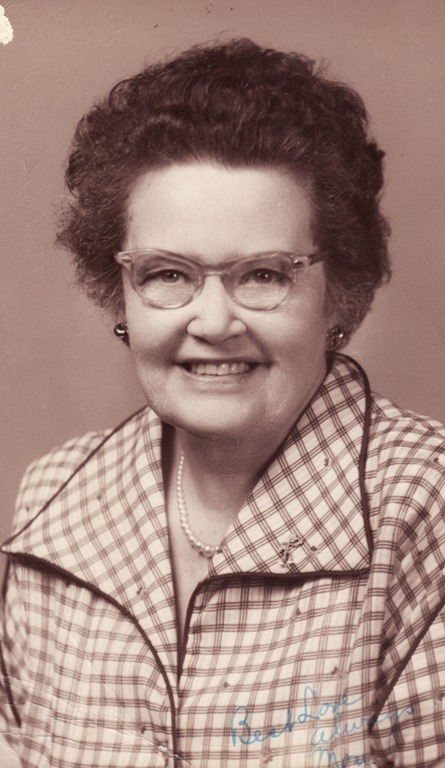 I do remember stories about her teaching in a one room school house, and that during the war she drove trucks and chauffeured officers as a staff driver. She had lots of old friends and loved to collect figurines of dogs. That’s not a lot to remember is it? That’s why these photos are so important. They are my only real evidence of the past. I’m like that guy in that movie Memento trying to figure out life with only short term memories. I have another photo of Ma. 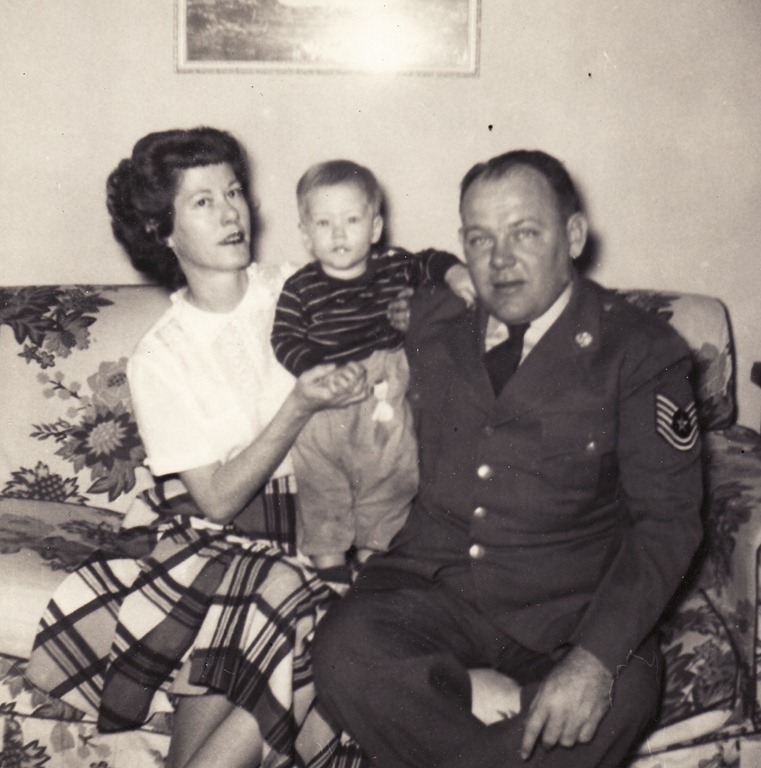 When my mother got tuberculosis and went to stay in a sanatorium up north at Valley Forge, and my father was stationed in Canada, Ma took care of my sister Becky and I for several months. This photo is from that time. She looks so old there, but was just 61. I’m turning 60 this year. This photo was taking in Hollywood, Florida around 1958-59. The house there is one of my favorites of childhood but I have no photographs of what it looked like on the inside. I’d give anything if my parents had taken more photos. I’m not sure who took the photo here, but I think it was taken to send to my mother in the hospital. 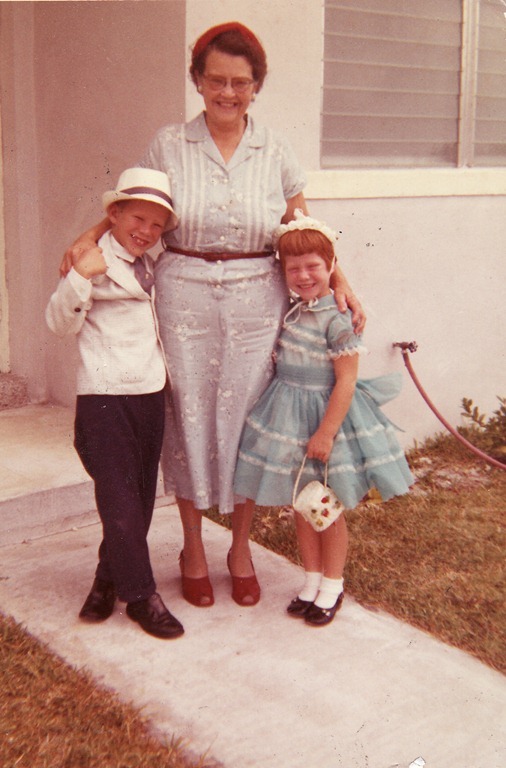 Those were our Easter outfits that year, and my snappy white hat blew out of the car window coming back from church. Would I remember that without this photo? I really don’t remember much about my father. I don’t have many photos of him either. Here’s one I like taken when he graduated high school. He’s a little younger in this photo than I was when he died in 1970. I was 19. I know very little about his teenage years, but I do know he hated my teenage years. I had long hair, did drugs and was against the Vietnam war. His dream for me was to go to the Air Force Academy. I don’t know what his dreams for himself were. Years ago I found a clipping from the Miami Herald that mentioned he and some of his classmates working on a project for the paper. He told me he delivered telegrams for Western Union to make money in high school. 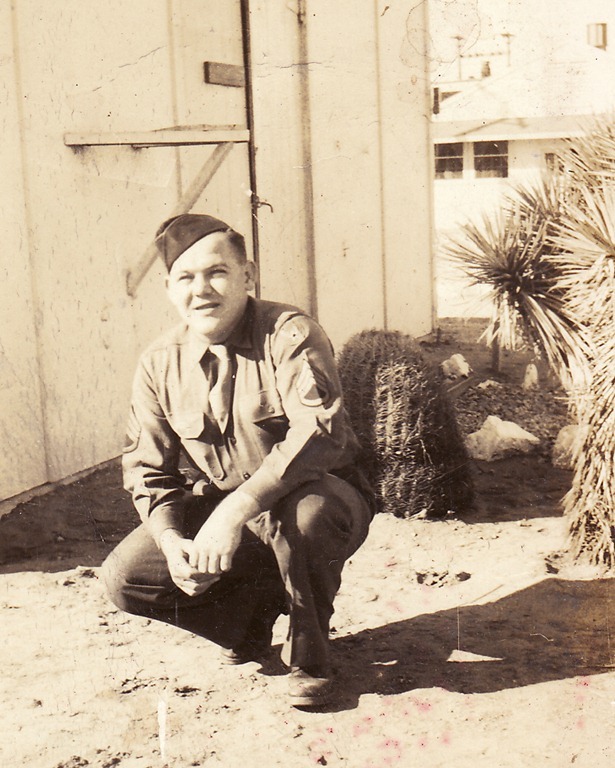 In 1942 he joined the Army and ended up a drill sergeant out in Arizona. Somehow he started in the Army but ended in the Air Force. I don’t know if he was ever in the Army Air Corps. Maybe these uniforms can reveal that. 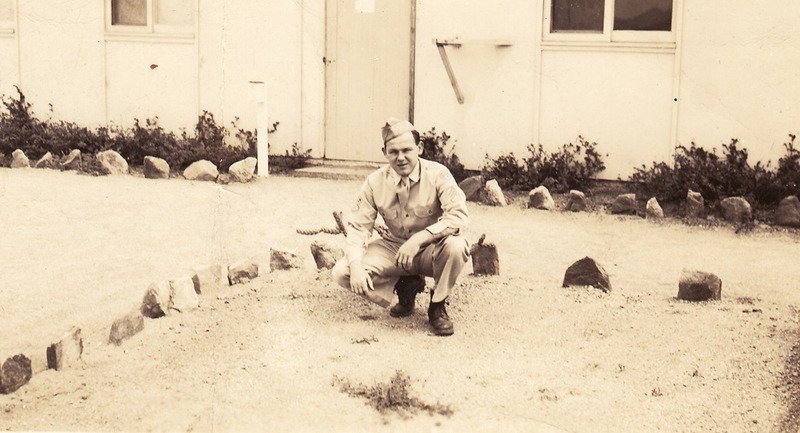 For all I know he could have been in the Army during the war and got out and then joined the Air Force. The last photo with me and my mom from 1952. The one before that was with my mom, before I was born, when they lived in Puerto Rico, probably round 1949. 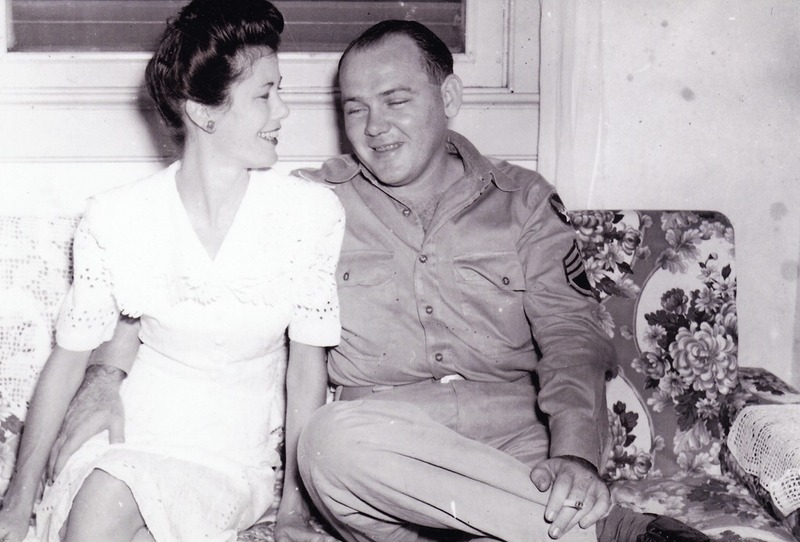 I think that was the happiest time of their marriage. For the first six years of their marriage they were told they couldn’t have children. I do know Becky and I were a handful. 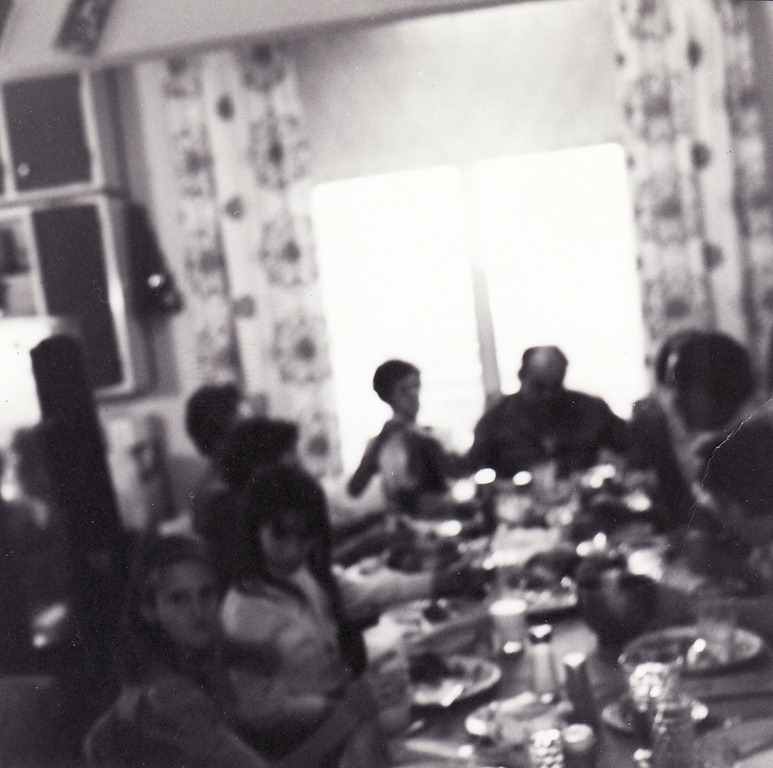 I can only find one later photo of my dad, an accidental photo, taken in 1969. He’s profiled by the light, shining on his bald head. That’s the thing, what kind of past would we have without photos to remind us? I have a responsibility to preserve the evidence that I have, but I don’t know how long people will care. We believe people continue to exist as long as other people remember them. That’s an interesting obligation. If you keep the family photos you become the family historian, and a detective. I really wasn’t prepared for this job. Instead of inheriting all the pictures when the last member of the previous generation dies, children should each be given a copy of the family photos when they are little and encouraged to talk to the people in the photos when they are still living. Probably good families do this, but we were wild active kids who couldn’t sit still. We were hyperactive before they invented the word. Like I said, Susan and I never had kids, so who will remember us? And I probably don’t have many more photos of myself than I do of my dad. I wished we were a family that liked to take pictures. I wished we had taken one good photo of every family member each year. I wished we had taken photos of all our pets. I wished we had taken photos of all my friends and classmates. I wished we had taken photos of all my houses, schools and neighborhoods. I even wished we had photos of all our cars. Hell, I didn’t know I’d get old some day and be tested on this stuff. And I certainly didn’t know it would be my own desires that would be doing the testing. I wish I had been forewarned that I would someday be the family historian and keeper of memories. For my next project I’m going to research how to properly find, repair, store, and maintain old photographs. My dad is our family’s genealogist. He has traced our history back many many generations. And like you he has many many family photos. He had tin-types that he got professionally photographed so we could preserve them. Maybe I should put you guys in touch? Your family photos remind me so much of those from my own family, Jim! I’ve got a million old photos here, and I always wanted to scan them and preserve them, but never got around to it. Already, I can’t identify many of the people in the pictures, especially in photos of children. And after I’m dead, no one will have a clue. In another generation, no one will care. I always thought that genealogy made history come alive. I had ancestors in Massachusetts and Virginia in the early 1600s, as well as in nearly every major immigrant wave through the 19th Century. That makes it easier to think of events back then as happening to real people, not just pages in a book. But time marches on. What’s important to me won’t be important to others. We all die. And soon enough, all memory of us dies, too. We’ve just got to accept that. Life is no less valuable because it’s fleeting. Still, I think it’s even harder to accept that the things which have meaning to me – photos, yes, but also books and mementos – won’t have the same meaning for anyone else. Of course, years ago, someone in my family gave away (to a museum) a lot of our old family photos. She assumed that they wouldn’t have meaning to later family members, but she was wrong about that. A lovely post. I have many photographs from my parents and grandparents, as does my wife. And my daughter, who knows little about anyone in these pictures, has still hung many of them on the walls of her home. A nice gesture. How we keep these memories going is something that I think about. And a journal is good, but interweaving these in the way you have done seems perfect, a labor of love. Barbara Hodgson does something similar in her fiction. I enjoyed this tremendously. I know these people now. Thanks. Next Next post: How to Organize and Store Photographs?? ?